Do you know what it means to have someone’s back? In the military, Got Your 6 means got your back. Got Your 6 is working to empower veterans and their families to ensure they are seen as leaders and civic assets. 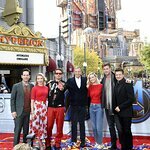 The video features Jeremy Renner, Mark Ruffalo, Chris Evans, Eric Stonestreet, Melissa McCarthy, Jessica Chastain and Kerry Washington.